Eighteen members of Lodge Dolphin No. 911 and three masonic friends visited Caer Urfa Lodge No. 4345 (EC), South Shields in the Province of Durham on Friday 5th October 2012. The Home brethren were overcome by the standard of the demonstration Master Mason Degree carried out by Lodge Dolphin No. 911. Several representatives of the Provincial Grand Lodge of Durham were in attendance and, according to reports, thoroughly enjoyed their evening. The harmony to follow was no less successful. The Lodge Dolphin Master was able to donate a sizeable sum of money to the senior representative of Provincial Grand Lodge to be added to their charitable fundraising cause. The pictures below shows Worthy Master Brother Stephen Callahan of Caer Urfa Lodge No. 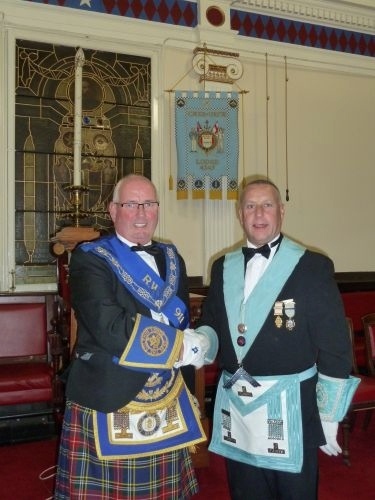 4345 with Brother John B Muir RWM of Lodge Dolphin. 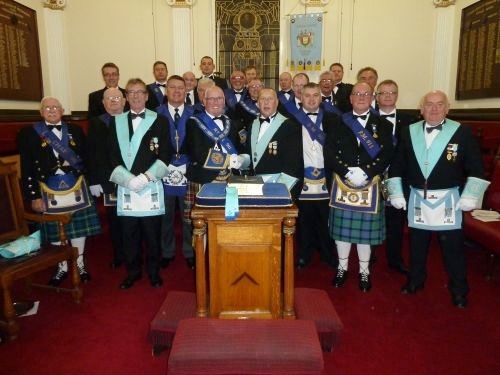 The second is a group picture of the brethren from both Lodges.